Times are tough and for most, travel is the last thing on their mind during a recession. However, I’ve been looking forward to this trip since last year, and there’s no way I’m putting this off, recession or no recession! Of course, this means keeping the expenses down and sticking to my budget (unlike what I did three years ago in Thailand). Often, the biggest expense in any trip is the airfare. Though admittedly, airplane tickets prices have gone down drastically with the onset of no-frills airlines, it still eats up a huge chunk of one’s travel budget. That’s why it’s best to book tickets ahead in time or to take advantage of the airfare promos offered by the airlines. You’d have to always be on the lookout for these promos, because you can really save (though in some cases, it *can* be more expensive — booking way ahead often leads to flight cancellation or re-booking). So how did I get round trip tickets to Singapore for less than US$100? The first step to getting great airfare deals is to canvas the prices of airfare from different airlines. Don’t limit yourself to the low cost carriers. Check out the fares of the full service airlines like Philippine Airlines and Singapore Airlines. They sometimes have fare specials, specially if your trip is less than 8 days long. For my trip to Singapore, I’m only considering two airlines: Jetstar and Philippine Airlines. I like taking Jetstar to Singapore because it flies from the NAIA airport (unlike Tiger Airways that flies from DMIA in Clark), and lands at the Changi airport in Singapore (not the Budget Terminal). Also, their check-in baggage allowance is 20 kilos, unlike other carries that only allow for 15 kilos. Similar to my trip to Hong Kong, which was brought on because of an e-mail newsletter I received from Mabuhay Miles, I received an e-mail from Krisflyer, Singapore Airlines‘ frequent flyer program. It turns out that this year is Krisflyer’s 10th anniversary, and to celebrate, they’re giving out 25% off the miles required for redemption, and even 50% off select flights. I have been lamenting that I’m short a measly 160 points to redeem a one-way ticket to Singapore from Manila, even with the 15% discount on online bookings, and with this promo, I can finally redeem a ticket to Singapore. Using Singapore Airline’s online booking facility, I booked my flight back to Manila from Singapore. A one-way flight to Manila from Singapore (or the other way around), requires 12,500 frequent flyer miles. 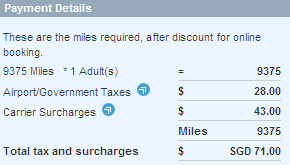 With the discount, I only needed 9,375 miles (I had around 10,500), and pay the taxes. The Singapore airport/government tax is SG$28, while the airline’s surcharges amounts to SG$43. Total damage to my credit card: SG$71 or US$46 or PhP 2,260.80. After booking my flight back to Manila, I went over to Jetstar to book my flight to Singapore. I wanted to fly out on a Sunday, but the fare has already gone up. I opted to fly out a day early, and availed of their promo fare — US$37. With the taxes, it comes out at US$50 or PhP 2,413.08, excluding the Philippine travel tax and the airport tax. Total airfare to and from Singapore: PhP 4,673.88. Pretty nice deal, no? Oi, ano ba ipapabili ko sa iyo? Or, maybe i can go there 3 days early so i can buy stuff then sabay tayo pabalik sg? Abbee: I know right? I can’t believe I was able to get it for such a great price. Reyski: Di ka rin kating kati umuwi no? Puede yun, onti din lang naman dadalhin ko, so puede ka pa dun sa 20kl allowance ko. NIIICE deal. I just caught something reading this entry—Philippine travel tax and airport tax? What are those for, by the way? Bchai: I’m not exactly sure what the Philippine travel tax is for. When you buy tickets with regular airlines, this tax is already factored into the ticket. However, when you buy online from budget carriers, this is not included, so you have to pay for it at the airport. As for the airport tax, it’s for the cost of using the airport (also known as terminal fee). In some (or is it most?) airports around the world, this is already included in the ticket price (like in Singapore). Jeez. We just get taxed to death, don’t we? I wonder why the budget carriers don’t add the tax. I mean, would it really be that much of a difference in the price compared to other regular fares? I’d rather just pay for the tax with the ticket instead of paying at the airport. good job on redeeming your miles. am guessing these miles were accumulated when you went down under before. i really liked this article of yours. more articles like this to help us budget travelers. i thought you got the email from jet star about their 98 dollars promo. i guess things are really bad in singapore when even the most expensive budget carrier goes on sale. I love SQ, and still have to try Jetstar. That’s a really good deal. wow, that’s great! i love love singapore air ;-) winner deal yan! Caryn: Sobra! I’m so happy I was able to book with them, and at such cheap price too! I just want to ask where can I buy plane tickets for jetstar? I was searching the net for hours but I can’t seem to find it. Tried calling their hotline but nobody’s answering weird eh. I read in your other blog that it’s in cubao? can you give it to me or contact numbers of their office in manila. i really want to try flying with them. found some positve feedbacks. And if you don’t mind for the air asia as well if you have idea..Online booking is not an option for me I had a bad experience with it. Thank you so much!! congratulations with that deal! In 2007, I also got roundtrip tickets for two to malaysia for only P6000! Then we took a bus to singapore too (hitting two birds with one, errr, ticket). lucky us! cheers! Pero the irony here is that I will be flying SQ then. At the time of checking kasi, PAL and Cebu Pacific (would you believe!!??) are more expensive than the flight I bought. Jetstar was 50 SGD cheaper but I forego it para kay SQ. i would like also to travel in asian countries esp. singapore. i have a friend whose daughter leaves there. can this help? i will be delighted if i will be inform of these promos.oct 23 is the beginning of our sem break till nov. 2. also on dec.
nice ha. resourceful. inform me also about the promos in the future ha.